Today we have launched our new web application. The system has been designed to include improved account management features, job editing facilities and a new approach to order processing. Overall this change will enable the Centre for Advanced Textiles to streamline its systems and processes and offer a central resource for managing customer accounts, orders and individual jobs. For your benefit, the new job editor enables you to select a fabric, input size and scale, and upload one or more images. It also offers advanced transform controls and larger previews, and we have introduced a new feature where multiple jobs can be created as part of each order, which saves you making individual transactions for each job. Our first priority has been to get a new image editor in place for our customers, therefore much of our time and effort has been spent on development. This means our existing website interface will remain in place for the time being. Over the coming months we will be looking at a second phase of development, which will see us launch a newly designed website in 2016. We hope you like the new image editor and look forward to receiving your feedback. Now we have introduced our new web application for image editing, and have set up our new printer range, we are are able to offer our customers additional cost savings. Should you have any questions regarding the new pricing structure, or if you would like to place an order for 1000 metres or more, please get in touch. These are per linear metre print costs only - they exclude base fabric, VAT and delivery. For our fabric prices please view our fabric page. After working with high-profile brands such as Emanuel Ungaro, Yves Saint Laurent and Matthew Williamson for almost 10 years, Elena Troulakis now creates designer collections and offers a bespoke service for individual clients. Having moved from Athens to London, she works from a home studio, partnering with pattern cutters, sewing machinists and her colleague and art director Clare Ceprynski, who does the styling for Elena’s collections. “These key people inspire me and, through their work and collaboration, help move the brand forward,” she says. Elena began by designing small collections, mainly sold through people in her personal network, who were able to give feedback to help her refine her work. Since then, the brand has been featured several times in Vogue Hellas, Madame Figaro and other publications. At the moment she only uses digital print, as it allows flexibility and precision. “Colour plays a hugely important role in the prints I design, and digital printing allows me to be free with colour,” she says. Although most of her work is at the designer end of the market, Elena aims to have a basic range of more accessible price points within each collection. Over the coming years, she plans to grow her business steadily and allow the brand to evolve and flourish in the international marketplace. Most important, she would like to keep the creativity flowing and to continue to produce inspired and beautiful collections. 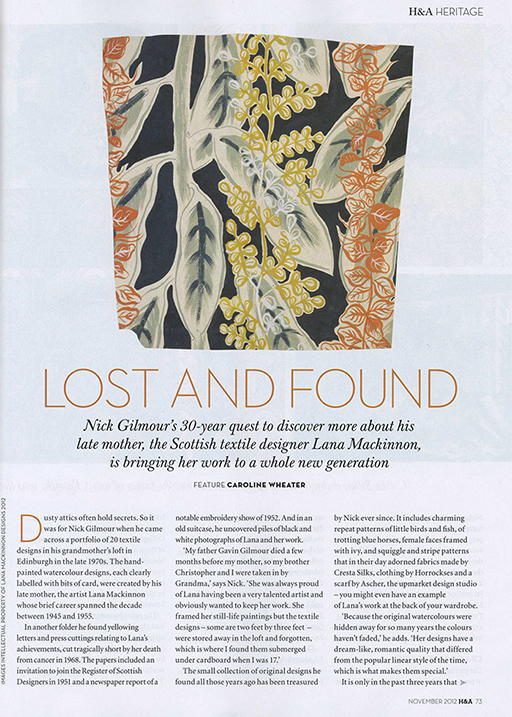 After receiving coverage for the Lana MacKinnon collection in the November issues of Elle and Homes & Antiques we’ve received lots of enquiries about the collection on Classic Textiles. Lana studied at Edinburgh College of Art, where she was a contemporary of Eduardo Paolozzi, and created fabrics for both fashion and interiors before her career was cut short by her death at 44. Read more about Lana MacKinnon or shop for the textiles collection. This month we launched the Lana MacKinnon collection on Classic Textiles. Lana MacKinnon studied at Edinburgh College of Art, where she was a contemporary of Eduardo Paolozzi, and obtained a Diploma in Design and Crafts in 1945. Lana created fabrics for both fashion and interiors, working for Cresta Silks, Horrockses and Ascher before her career was cut short by her death at the age of 44. In 1946 Lana was included in the ‘Britain can make it’ exhibition in London, where she showed with other prominent designers such as Ernest Race. A member of the Royal Scottish Society of painters, Lana also specialised in book illustration, most notably Margaret Lusty’s ‘The Foundations of our Society’ 1966. Her designs are being reproduced with the permission of her two sons Nicholas and Christopher Gilmour. At Classic Textiles we accurately recreate textile design classics of the 20th Century using state of the art digital printing technology. With the consent of the designer or estate, the designs are faithfully reproduced onto a linen union base. 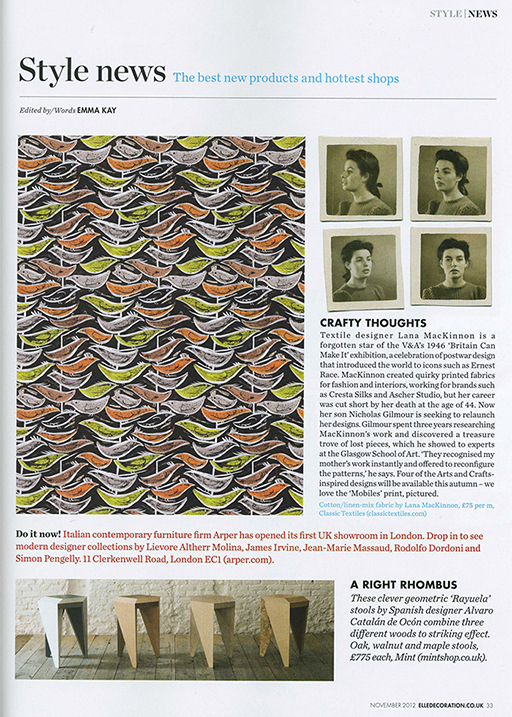 The collection was launched in 2003 with 12 designs by Lucienne Day and is being continually expanded. Here at CATdigital we’re constantly striving to improve our services, both offline and online. Since the launch of our website just over a year ago many of you have requested new features and we’re keen to find out more about your experience of using our website. To help us determine your needs we’re asking you to complete a short survey and enter our a prize draw to win £100 worth of credits. Chrysanthi’s work is informed by her research into the properties of light and space, including the geometry of light and refraction effects. Based on the instinctive process of spatial awareness, it’s an investigation into the perception of space in natural and manmade environments. Her core idea, that space doesn’t always have to be described in visual terms – some environments are an open expanse without visual marks – has led her to find ways to interpret and analyse this notion in her printed textiles. Chrysanthi’s participation in New Designers allowed her to gain positive feedback and promising contacts. “It was a great experience and an excellent opportunity to see and to be seen. I talked about my work to other graduates and I listened to their stories,” she says. During the exhibition, Chrysanthi was awarded the Clothworker’s Company Associate prize. Not only was this a great honour, but it was also accompanied by a financial reward that will be a substantial help in planning her next project. Her plans include travelling, gaining experience through internships, collaborating with people in other disciplines and continuing to learn and evolve as a designer. Working as a freelance designer at a textile studio has proved a good opportunity for Jo Faulkner to continue enjoying creative freedom, while operating within a supportive framework where her work is guided into a more commercial market. The freelance life also allows her the time and freedom to pursue other activities. 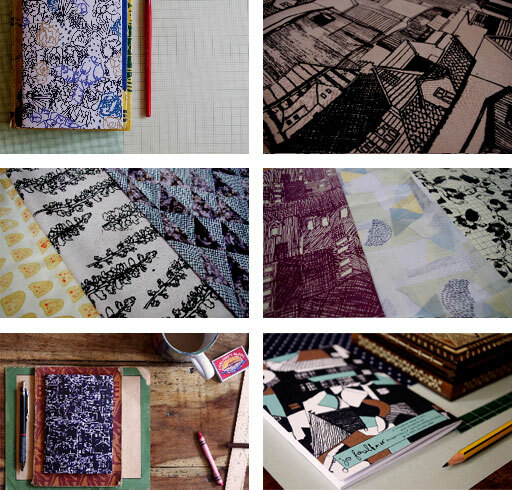 At the moment she is launching some of her surface pattern designs into the notebook and stationery market and has started to sell into shops in Glasgow and London. A graduate from The Glasgow School of Art, Israel Parra-Zanabria creates designs driven by the rich culture of Mexico: vibrant floral collections combining traditional silk-screen techniques and digital processes. 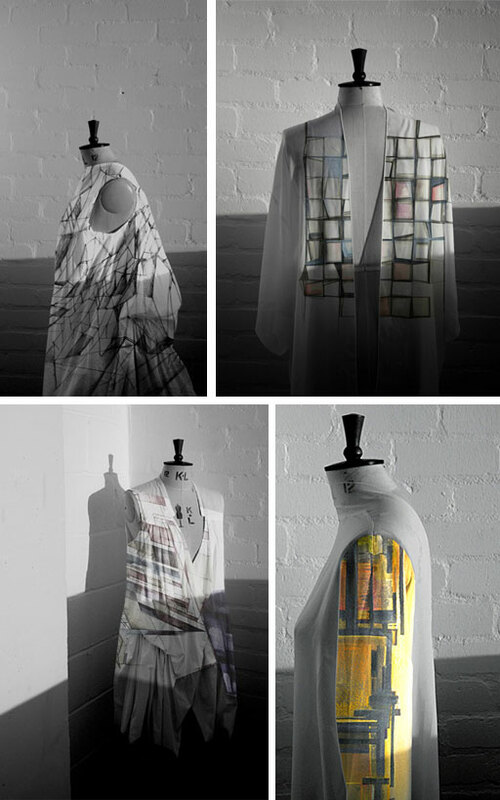 After exhibiting at New Designers 2012, he was selected to exhibit his graduate collection at Texprint 2012. “New Designers 2012 was a great opportunity that allowed me to experience the high level of talent and vast opportunities the textile industry offers in the UK,” he says. Israel is currently designing a new collection of printed scarves to exhibit in Paris at Indigo 2012. He expects this opportunity will not only allow him to experience the level of competition Europe has in the textile and fashion industry, but also to demonstrate the design quality he has gained at The Glasgow School of Art. Fiona Douglas is the creative brain behind textile design company Bluebellgray. The company specialises in the home interiors market, producing unique and individual designs for the home. A graduate of the prestigious Glasgow School of Art, where she specialised in Printed Textiles, Fiona worked as head designer for a leading fabric company before setting up her own company. 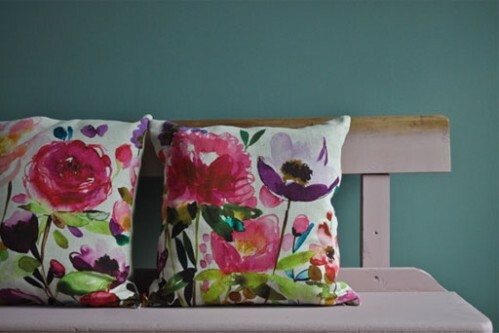 Influenced by a love of colour and all things floral, each design is painted by hand in the Bluebellgray studio. It’s then printed on to natural cottons and linens, using state-of-the-art printing technology to perfectly capture every brushstroke and colour. Based in the west end of Glasgow, the company was shortlisted for an Elle Decoration Design award in 2010 and its designs have been featured in leading magazines such as Vogue, House & Garden and Country Living. Fiona: I developed my style of watercolour designs for textiles at GSA [Glasgow School of Art]; while there I also discovered the Centre for Advanced Textiles. After graduating I spent a few years gaining experience and knowledge working for a large fabric company. I then realised I wanted to work for myself and set up Bluebellgray in 2009, literally starting from my kitchen table. We’ve been going now for three years. Who else is in your team? Fiona: My role is design director and I’m supported by our design assistant Carrie, office manager Georgie, office assistant Emmi, and Wendy, who looks after Bluebellgray’s PR and marketing. I’ve been so inspired by having Carrie and Wendy on board. It’s quite difficult when you are working by yourself, you can really suffer tunnel vision. With colleagues you can bounce ideas off one another. My husband Phil is also involved: we call him the ‘sorter-outer’ and we have additional help from work experience students. What sort of market do you supply? Bluebellgray sells to a medium- to high-end market: John Lewis, Liberty, Harrods and a range of independent boutiques. Bluebellgray also sells to a global market, which includes Bon Marché in Paris, Lane Crawford in Hong Kong, Gump’s in San Francisco and Mitsukoshi in Japan. Why is digital printing your choice of process? Digital Printing was the natural choice for my designs. It allows me to interpret them exactly as they are, which means I don’t need to compromise on scale or colour. Digital printing allows us to capture the essence of the design. So many people have asked if our products are hand painted. I feel the heart and soul of the design gets transferred to cloth with this method and that is what I love about it. If we had to print traditionally, we could have only afforded one design. Digital printing allows us to produce a collection, and with the opportunity of shorter runs, printing digitally is affordable. CAT offers great service and great quality. We work to very tight deadlines and being able to print a quality product with CAT within a couple of weeks is vital to keep us at the forefront of the market and move our designs forward quickly. The fact they are just down the road is an added bonus and they are always on hand to discuss our needs and ideas. They are at the forefront of digital printing and true experts in their field. Do you offer your customers bespoke services? We don’t offer a bespoke service but it would be a long-term dream to get back to customer-focused design. I hope we can be bigger and better, while still producing the best designs we can. I am passionate about keeping Bluebellgray in Glasgow and Scotland. When I graduated it saddened me that there was very little opportunity in Scotland so I hope with us being here we can give more textile graduates an opportunity. In five years time I hope to be as happy and still love what we do! In 2010 CAT received funding from funding to collaborate on a new product with Iona Crawford, a Scottish fashion designer based near Stirling. This new scheme from the Scottish Funding Council (SFC) is aimed at building relationships between SMEs (Small to Medium sized Enterprises) and HEIs (Higher Education Institutes) in Scotland. The project’s aim was to develop a new collection of digital prints on cashmere. The challenge here, was not only for Iona in designing the new prints, but also for the CAT team to prepare and print such an expensive base fabric to receive the digitally applied dyestuffs. The final collection has been showcased at various national and International events. In October 2008, CAT began working with Timorous Beasties on a collaboration funded by the UK Technology Strategy Board. In response to the theme: ‘Exploiting Digital Technologies’ the purpose of the BeastiesLAB project was to explore the potential benefits of a digital workflow based on the idea of co-creation. This involved the development of a retail installation that invited customers to create their own cushion by interacting with Timorous Beasties print designs through a playful experience that brought their content to life. With products being digitally printed at CAT only once a customer had purchased the product, this on-demand approach offers greater flexibility and reduced risk for designers whilst providing customers with a unique product (and memorable experience). Aside from these commercial benefits, the focus of the project was to explore the creative opportunities enabled by co-creation. In order to ensure customers did not feel as though they were ‘using a computer’ the interactive scenes were controlled using a Nintendo Wiimote with colourways being selected using printed swatches with embedded RFID tags. The video below shows the final concept. BeastiesLAB: Design from TechStyleLAB on Vimeo.